I went with a couple girlfriends to see the Home Alone House the other night. It’s a short drive North of the city, in Winnetka, an uber-affluent neighborhood in Chicagoland. I knew before we left that regular folks like you and me probably lived inside the semi-famous home. Any other way wouldn’t have made any sense. But I didn’t really believe we’d be stopping on the street to take photographs of someone else’s home, discussing the nature of public property and legal rights, concocting plans to drive around the block and circle back inconspicuously until all of this was upon us. 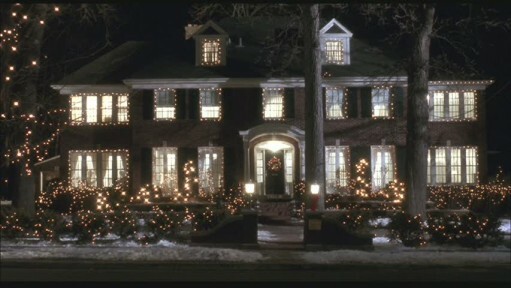 How strange would it be to live in the Home Alone house? All year, I’m sure, but especially around Christmastime, folks take their cars down to neutral and creep by at impossibly slow speeds to point out the side entrance where Harry and Marv tried to enter or the window on the left which is Buzz’s bedroom on the second floor. There are floorplans of the house online, pictures of the home’s interior, factoids strewn about on countless sites. It can’t be safe or comfortable. Plus, the market value of the place is something just shy of 2 million dollars. Fyew! Nonetheless, we had a fun little drive-by, packed with excitement and photos. We passed a fistful of churches and thought each and every one was the church where Kevin hides in the nativity with no proof that any of them were the church where Kevin hides in the nativity. I think someone was watching us watch them when we drove by the house the first time, but I guess we’ll never know. You think they’d be used to it by now. Next time, we’ll ring the doorbell and “deliver” a Little Nero’s pizza.